Re-charted pattern to more familiar symbols. Changed the 4-round cable to a 5-round cable to better fit in with the lace pattern. Worked heel flap in rib and carried it up the back of the sock. Toe-up heel-flap-and-gusset taken from a WendyKnits pattern. They look really good and thanks for sharing where the pattern is from – Drops patterns are lovely and inspirational. Thank you! DROPS is really great resource for free patterns. didn’t you really want to know that? lol! I *love* random factoids – you know that! Walnut dye is notoriously difficult to remove – did you have any such problems with the socks? Was the yarn dyed with walnuts tea only? 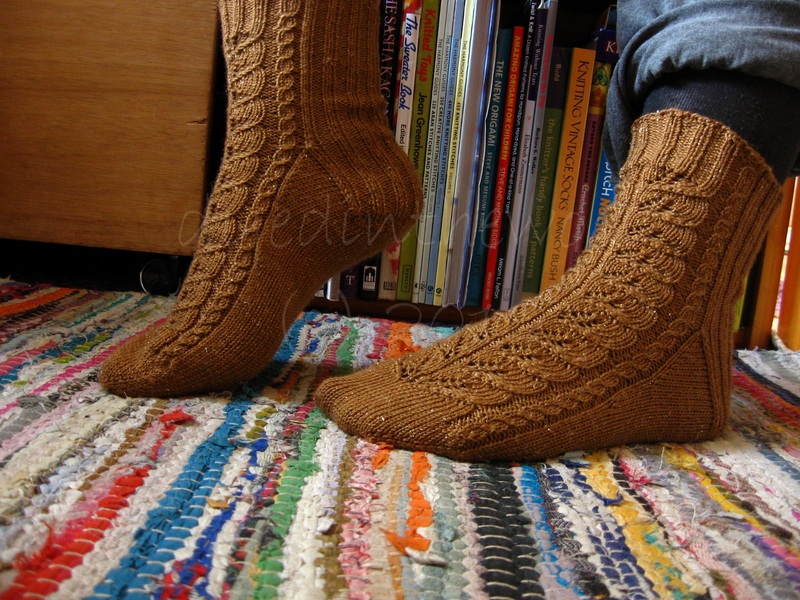 Oh, glittery socks and you showed great fortitude to complete the cables. The walnut dyes the wool beautifully.